The LAPD’s crackdown on some of the more upscale trucks on the Miracle Mile portion of Wilshire last week is resurrecting fears that law enforcement is still willing to find any excuse to hassle food trucks at the behest of competing restaurants. An online petition is circulating (we didn’t start it this time…I promise) with the hopes of expressing customers’ anger at having their options limited due to picky parking tickets. 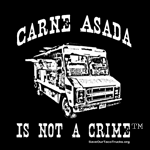 Do your civic good deed for the weekend and hopefully law enforcement can start enforcing laws that affect us, rather than the bottom line of Big Taco. See the LA Times story here. Wow! It’s been a while since we’ve updated this site as various battles have been going on in the courts but until lately, there hasn’t been much to report on. Today the Los Angeles Times website reported that volunteers from the UCLA Labor Center helped fight the city ordinance that until recently hadn’t been enforced against the trucks. The city ordinance was similar to the county ordinance in that it limited trucks to between 30 minutes and an hour (depending on the exact area). The more important difference for many of us is that this directly affected many of the trucks we visit: (Echo Park’s Taco Zone and Eagle Rock’s Leo’s Tacos for example.) Even the popular more gourmet incarnations of these trucks were often in violation of these rules and could have been cited and eventually put out of business were the LAPD to enforce the ordinance against them. (Think of every time Kogi parks on a city street for more than 60 minutes!) The bad news here is that we doubt the fight is over. The good news is that the politicians have been dealt another setback which will force them to negotiate a more reasonable solution with the loncheros. 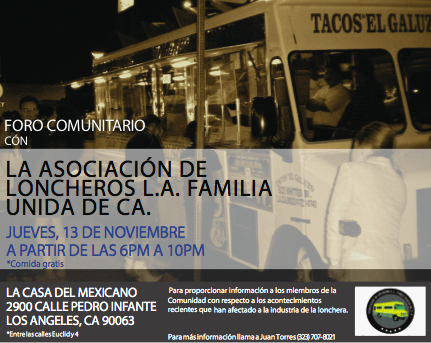 If you want to thank someone, congratulate the truck owners, or just enjoy some good food and music, the Loncheros Association will be celebrating their recent granting of trade association status tomorrow night at the UCLA Downtown Labor Center. The group promises presentations by the affected members as well as by supportive politicians and community leaders. If a similar event in East Los Angeles last year is any barometer, come hungry. New Taco Ordinance in Rancho Palos Verdes? Uh oh…KABC and the Daily Breeze both report that Rancho Palos Verdes is considering an ordinance limiting the time taco trucks can be parked in a particular location in an attempt to stem the spillover of loncheros caused by a similar ordinance in neighborhing Palos Verdes Estates. We just received the call from Phil Greenwald today, so we’re going to take a little more time while we consider our response. Keep up the good work Kogi, and we’ll visit again when the lines get a little shorter. It looks like our cousins across the pond are even getting on the taco bandwagon. LA Taco linked to this tantalizing picture of an English taco truck that looks like a dwarfed version of London’s classic double-decker busses. During my visits, the only food I found agreeable was from the city’s immigrant communities. In Oxford, the truck serving schwarma, hummus, and french fries was a nightly staple. Cheers! So NBC is awarding its Golden Local trophy for best taco in LA. The finalists: Tito’s Tacos in Culver City and Henry’s Tacos in North Hollywood. It looks like NBC simply asked their interns where they get their Tex-Mex. I wouldn’t feed these guys’ ground beef and grease in a hard-shell taco to the feral cats out back. Please, take a moment to log onto their website and spell out why they’re idiots. Hurry, voting closes tomorrow night. If you’re looking for a way to have a fun time, eat cheap, and educate your friends, why not take them on a taco truck tour of Los Angeles? Things are quiet on the legislative front but don’t let the county’s seeming docility fool you. West Hollywood has begun cracking down on hot dog carts and a bit farther afield, Italy has banned the opening of any new “ethnic” restaurants. Think that kind of discrimination can’t happen here? Engage in any conversation (especially on the NELA mailing list) about the trucks, and someone is bound to use the terms “anchor baby”, “peddle”, “illegal alien”, and “infestation”. To help fight this ignorance we took a group from East Los Angeles to Echo Park last weekend on a tour of several of the taco mainstays. Read all about it on our sister sight, www.yorkblvd.com. For those of you who live in our neighborhood, Highland Park, we hope you were as disappointed as we were when the Boulevard Sentinel editorialized against taco trucks and other street vendors. We’re happy to engage in constructive debate over the future of Los Angeles food culture, but unfortunately, Mr. Topping resorted to long-age discredited misconceptions about our beloved trucks. We expected much more of our local periodical than for them to act as a mouthpiece for the county’s misleading arguments about street food. Read an excerpt of the Boulevard Sentinel’s editorial and our response on our sister site, YorkBlvd. Yes, this is very late notice, but Erin Glenn, part of our team will be interviewed on the Gustavo Arellano show today at 4 pm on KPFK 90.7 FM. Tune in and stay updated! We’ll post the podcast when it’s available. The Asociascion de Loncheros La Familia Unida de C.A. continue organizing against future legislation and have launched their own website. It’s mostly in Spanish, but visit www.loncheros.com to stay abreast of their meetings and announcements. The county and cities still have legal avenues to make an end run around the California Superior Court’s previous ruling in favor of the taco trucks. Stay informed and practice your Spanish! This week La Asociación de Loncheros L.A. Familia Unida de CA. (the newly formed association of taco truck owner) is holding a community form on Thursday, November 13th.